Will be available in 22 days on Fri 10 May 2019. Master bedroom: king-size bed, wardrobe, aircon, balcony. Access to shared bathroom with hot shower. Bedroom 3: study/computer room. WiFi Internet in the whole house. The house is located in Phanason Residence (google maps. 600 Meters from the main road. On the main road: 100 meters to the Makro and 400 meters to Old and New Central Festival. International school 'Headstart', Phuket International Hospital and Tesco Lotus within 1 kilometer. 3 Kilometers to Kathu and Phuket Golf Country Club. 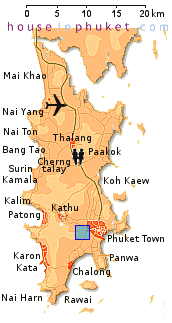 Patong is 8 kilometer. Western kitchen: gas cooker with hood, fridge, microwave, kitchenware, oven. 1 with cold and 1 with hot shower. Living room: sofa, TV, aircon. Covered sitting corner at the back. With spare water tank. At the last street of this villa park, so not much bypassing traffic. 200 meters walking: large communal pool. 50 THB per person. Nicely designed townhouse with all things you may need. New Central Festival, Makro within 3 minutes. Managed by Wellta.